Previously on the Healthy Heels blog, I wrote about selecting a method for organizing. We also asked YOU what methods you use, and how happy you are with your organizational techniques. Well, looks like about half of you all use electronic methods only, and a third of you use some combination of the both paper and electronic methods. Many of you said you could be a little more happy with your organization techniques, and in this blog post, we’ll present some tips for getting and staying organized. What are the important things you’d like to organize? Is it tasks, appointments, meetings, ideas, other things? Answering this question will help determine which methods you use to organize and how you choose to organize things. I found it helpful to think about all of the things I wanted to organize, and what kind of information I needed to organize for each. My schedule is filled mostly with appointments, meetings, calls, classes, and blocks of work time, so I found it helpful to organize day-to-day. However, as another example, my partner works on longer-term creative projects, and it’s difficult to fit those types of things into days. Instead, he chooses to organize by project. What resources do you have available to you already? What resources do others around you tend to use? If you use an email account, do you have a calendar that goes along with that account? For how long will you have this email address available to you? (Beware that school email expires after graduation, and unless you find a way to sync, you may not have access to all of your previous appointments, or your recurring reminder for rent after you leave school.) Also, I’m not necessarily advocating for using what other people use, but if your friends are always sending you an iCal or Gmail appointment reminder for hanging out, that could persuade you to use the same option. I found that my organizational style was pretty closely tied in with my learning style. In classes, I need to physically write things as part of the learning process. For some reason, when I took electronic notes, the learning process just wasn’t the same. I found that I tended to learn way more and was more engaged in the learning process when I was taking notes down with paper and pen. This is definitely something that varies from person to person, though, so if you’re an electronic note-taker, you may be a great fit for an electronic calendar! What are you most likely to look at every day? Try and choose a method that easily weaves into your schedule. For example, I spend most of my days at a desk working on my dissertation (I hope you see this, advisor! ), so it was important for me to have something that could sit on my desk, that I would look at every day when starting my work. However, I can imagine that if I were still taking classes and bringing my laptop and/or smart phone everywhere with me, it might have been just as helpful to have an electronic method of organization. It can be really helpful to have categories of tasks when creating a to-do list. I’ve got three running categories each week in my planner: my dissertation (again, hope you see this, advisor! ), general life things, and student wellness projects (like writing blog posts). I find that it keeps my tasks tidy, and also means that when I’m working on a particular type of project – like sitting at my desk working on my dissertation – I can hone in on just one category of tasks, without getting overwhelmed by all of the other things I have to do. Ah, the art of phrasing! When writing down a task or creating a to-do list, tasks should be things you can actually accomplish. This probably sounds obvious, but somehow every few weeks I sneak the task of “doing my dissertation” in my planner, and get frustrated because I don’t know when I can cross it off my list. Where possible, it’s helpful to use action words (“make an appointment with…”, “edit the methods section…”, “pay rent”) rather than more ambiguous tasks (“figure out what to do with my methods section…”, “understand who to make an appointment with..”). Also, if you’re like me and you’re a sucker for crossing things off your list, don’t be afraid to list the things that are just a part of your day or week. “Paying your rent”, “Food shopping”, and “Calling Mom” are all respectable tasks, and will make you feel productive when you cross them off the list! It can be clumsy when starting a new organizational method, but it’s important to try and stick to a method (or methods) for at least a little while to see how it works for you, and what specifically could work better. In my case, I found that certain things in my planner were easy to consistently keep in my planner—like tasks and appointments. However, bigger things like project planning were difficult to fit in my daily planner. I found it helpful to make explicit agreements with myself about how things were going to be organized. For example, tasks always got written into my paper planner, appointments were also written into my paper planner, but ideas for ongoing projects or event-planning go into an electronic source (e.g., my Evernote file, a dream project spreadsheet, etc). Have a system in place for crossing over between organizational tools. Ultimately, I try and keep all of my tasks and appointments written down in one paper planner. But what happens when I am planner-less and meet with someone who wants to set something up?! Or, what happens when you get an email detailing some tasks to accomplish? In my experience, lapses in organization can happen when you don’t have a system in place for how you’ll get things into your organizational method. So, in my case, I only book appointments when I’m by my planner, and flag emails that I should follow-up on, and then write in my paper planner that I should follow up there, too. 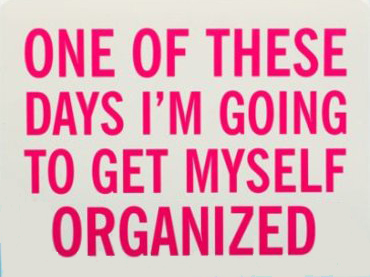 Do you have any other tricks for staying organized? Let us know in the comments section!